Mahindra TUV 300 gets "Luxury Kits"
Mahindra and Mahindra is known for their expansive choice of customisation available for their range of models. Mahindra TUV 300, which is a sub 4-meter compact SUV, gets a new luxury kit that makes the compact SUV much more comfortable and plush. Mahindra has officially posted the details about the new kit on their website. 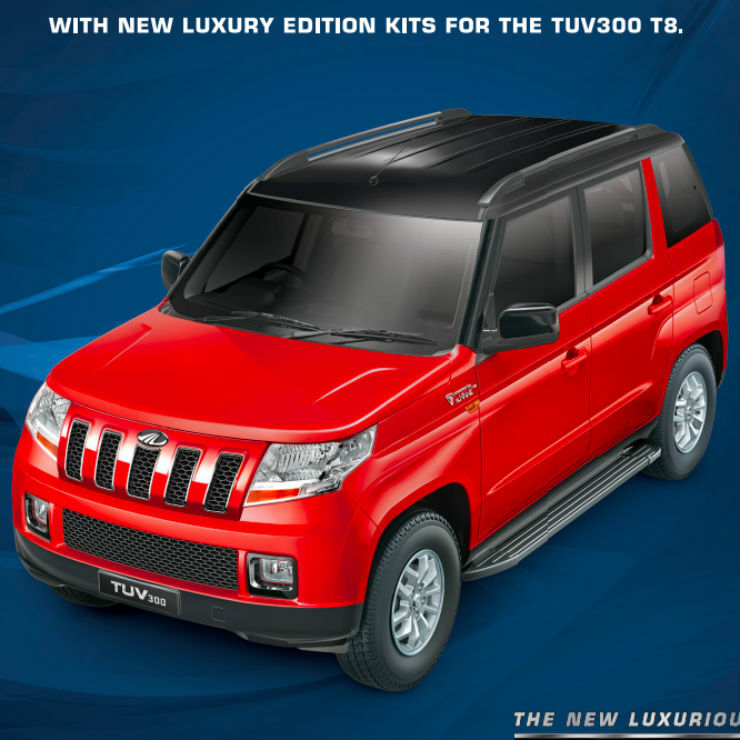 There are two different types of luxury kits available with the new TUV 300. In type 1, the accessories include faux leather seat covers and a premium beige steering wheel cover. It also adds a new 6.2-inch touchscreen infotainment system with navigation and a reverse camera to the vehicle. The kit also includes premium chrome accent on the license plate, premium chrome finishes on the ORVMs, chrome on the lower front grille and chrome cover on the door handle. There is also a more advanced Kit 2 that gets all the features of the Kit 1 plus a few more accessories. 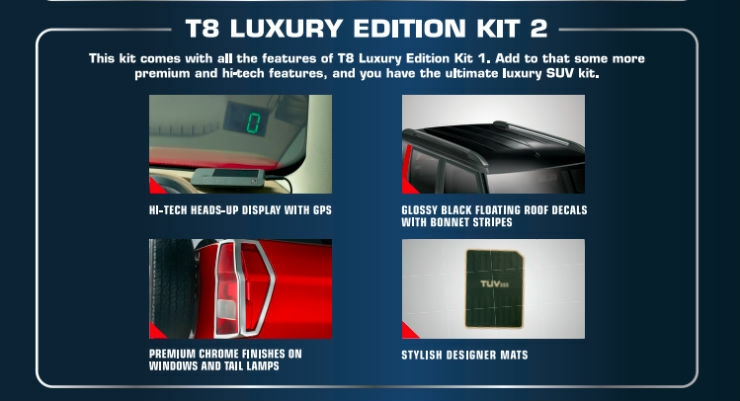 The Kit 2 offers a head-up display unit with GPS, a floating roof with contrasting decals on the roof, chrome insert on the window and tail lamps and TUV 300 branded floor mats. Interestingly, Mahindra also offers an Endurance kit with the TUV 300, which makes the SUV much more rugged looking. Mahindra offers various customisation options to its cars and a few factory-custom options like the Thar DayBreak, Scorpio Stinger and more. Earlier this year, Mahindra announced that all the variants of the TUV 300 will get the more powerful version of the engine. All the variants of the vehicle are now powered by a 1.5-litre twin-scroll turbocharger, 3-cylinder engine that generates a maximum power of 100 Bhp and 240 Nm. Until recently, Mahindra used to be the only manufacturer in the segment to offer a diesel-AMT automatic transmission. However, Tata has launched the Nexon AMT that is available with petrol and diesel engine options. The price of the new kit is not out yet but interested customers can contact the Mahindra dealerships directly. The kit comes with a warranty and ensures that the original car warranty also remains intact.